While I’m in “Kitchen/Dining Room mode,” I noticed that there are quite a few mugs and miscellaneous glasses in our cupboards. Almost none matched. 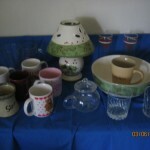 On one hand, unique drinking cups are an advantage since guests can keep the same glass throughout an evening, day, or weekend. (Saves wear and tear on the environment and reduces washing since our dishwasher is still broken). BUT, the mis-matches don’t look so pretty when setting the table. SOLUTION: I found these wide multi-colored rubber bands that can be put on each glass. Presto – instant individualization! 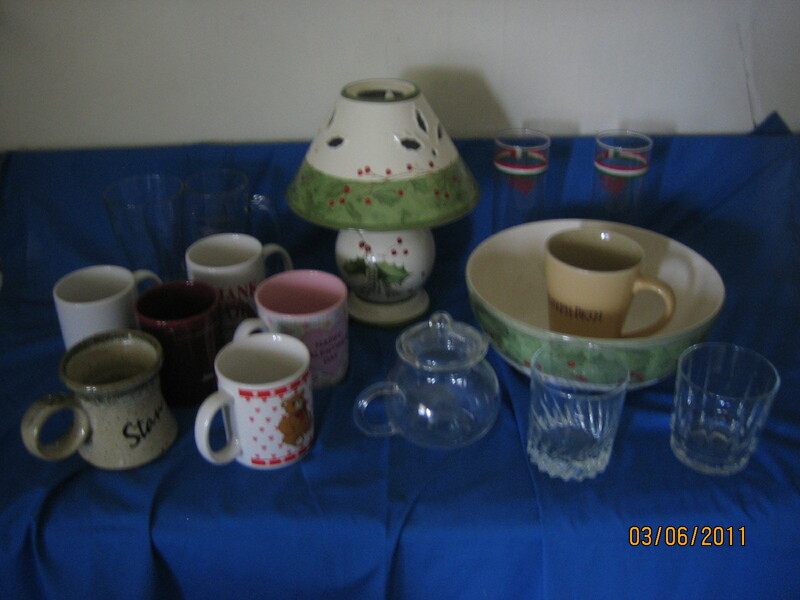 So, I bought a few matching glasses and am giving away 7 mugs, 10 glasses, a lamp, matching bowl, and glass teapot.